Click the funnel button from the title bar. The Advanced Filter interface for Defense+ events will open. Application: Selecting the 'Application' option displays a drop-down field and text entry field. For example, if you select 'Contains' option from the drop-down field and enter the phrase 'cuckoomp3.exe' in the text field, then all events containing the entry 'cuckoomp3.exe' in the 'Application' column will be displayed. If you select 'Does Not Contain' option from the drop-down field and enter the phrase 'cuckoomp3.exe' in the text field, then all events that do not have the entry 'cuckoomp3.exe' in the 'Application' column will be displayed. Flags: Selecting the 'Flags' option displays a drop down menu and a set of specific filter parameters that can be selected or deselected. 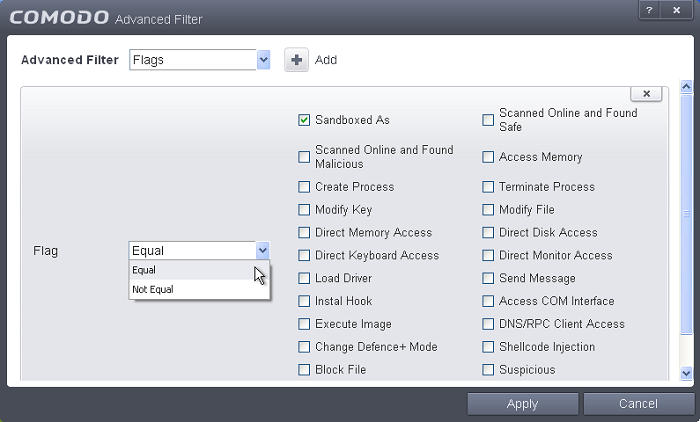 For example, if you select 'Equal' option from the drop-down field and select 'Sandboxed as' from the checkboxes, , then only events of applications auto-sandboxed by Behavior Blocker will be displayed. If you select 'Not Equal' option from the drop-down field and select 'Modify Key' check box, then all events that do not have the entry 'Modify Key' in the 'Flags' column will be displayed. You can select more than one check box options from this interface, as required. Target: Selecting the 'Target' option displays a drop-down menu and text entry field. Enter the text or word that needs to be filtered from the Target column. For example, if you select 'Contains' option from the drop-down field and enter the phrase 'svchost.exe' in the text field, then all events containing the entry 'svchost.exe' in the 'Target' column will be displayed. If you select 'Does Not Contain' option from the drop-down field and enter the phrase 'svchost.exe' in the text field, then all events that do not have the entry 'svchost.exe' in the 'Target' column will be displayed. Click 'Apply' for the filters to be applied to the Firewall log viewer. Only those Defense+ entries selected based on your set filter criteria will be displayed in the log viewer.